Grand Cayman is connected to Cayman Brac and Little Cayman by internal flights run by Cayman Airways Express (www.caymanairways.com) and the charter company Island Air (www.islandair.ky). Services to the Sister Islands are regular and fares are kept low as a result. Travel between Grand Cayman and the Brac/Little Cayman is around 30 minutes and about 10 minutes between the Brac and Little Cayman. Blink and you’ll miss it. It is virtually impossible to travel to the Sister Islands except by air. Driving on-island can be a hairy experience; with so many different nationalities present in Cayman (over 100), that means over 100 different experiences of road rules and a Wild-West feel. Keep your wits about you, drive at your own pace (and on the left) and you’ll be OK. The worst thing about car drivers on-island is that both left-hand drive and right-hand drive vehicles are present. Even the police have their driving seats on the ‘wrong’ side of much of their fleet! By Caribbean standards, the roads throughout Cayman are of excellent quality. Beware of potholes on smaller roads. The roads often flood during Caribbean downpours but are astonishingly well drained and within hours will be dry again. Everywhere is accessible by car. Most roads are the equivalent of B-roads, with the exception of the North-South route to and from West Bay, which is a relatively new dual carriageway for most of its length. Cayman also features a slightly confusing blend of American and British road configurations including centre turning lanes, three- and four-way stops plus roundabouts, which can be a little hairy at times. In Grand Cayman, most major car-hire companies are represented at the airport or in George Town. Private limousine services are available for special events and airport transfers. You can also hire cars on Little Cayman and Cayman Brac. Insurance is a must. Cars range from the smallest compacts to large SUVs and, increasingly, electric vehicles. There are also classic cars available for special occasions. As with most things on-island, rates are higher in the winter high season which runs roughly from mid-November to early May. You must be over 21 and hold a valid driving licence. You may need a special visitor permit which will be charged at the hire office. There are taxis operating on Grand Cayman from all resorts, the cruise dock at George Town and the international airport. They offer a fixed rate per vehicle or per person to all points on the island. A sign with current rates is posted at the cruise ship dock in George Town. 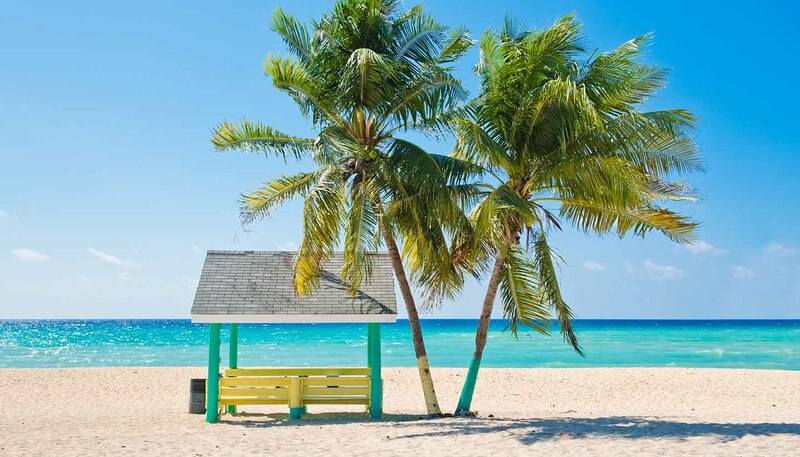 Taxis in Cayman Brac are limited, and best pre-booked. Be wary of rogue operators; if you are staying in one of the major hotels, ask them to book in advance and agree a price before going anywhere. Most taxis are extremely reliable and the operators honest, but horror stories of $100 journeys are not unknown either. Mopeds, scooters and bicycles are available for hire on all three islands. Motorcyclists are required by law to wear a helmet at all times. On Cayman Brac and Little Cayman, most hotels have bicycles available for complimentary guest use. Bicycles aren’t generally the preferred method of travel on Grand Cayman, although a number of brave souls do take their future in their hands amidst the enormous motor vehicles prevalent on the island. The Sister Islands are arguably best-seen by bike – but remember, in Little Cayman, iguanas have right of way! Grand Cayman does have a number of bus routes to all points on the island, nearly all during the daylight hours. These are operated by individuals and run to and from the bus depot in the centre of George Town. There are bus stops, but you can often pick up a bus anywhere just by hailing them down as you would a taxi. Indeed, the drivers ask you via a quick beep of the horn whether you require their services – and it’s not unknown for an empty bus going in the wrong direction to pick you up and go back on themselves. Drivers must be over 21 years of age. Strictly enforced speed limits are generally 40-48kph (25-30mph) in built-up areas, 64kph (40mph) outside these, and - on Grand Cayman - 80kph (50mph) in rural areas east of Bodden Town. The National Roads Authority (www.caymanroads.com) has further information. Seat belts must be worn at all times. Full insurance is required and must be arranged with the car-hire company; some companies will not insure drivers under 25. It is an offence to use a mobile phone to call or text while in control of a vehicle. Hands-free sets are, however, allowed. Do not use your phone at a red light – even if you have stopped there you will be ticketed. Cayman’s Auto Club (www.autoclub.ky) offers 24-hour roadside assistance for members – otherwise it’s going to be a pricy garage callout. There are numerous garages on island for everything from major repairs to replacement tyres. A temporary local driving licence is required, which is issued from the police station or car-hire agency at a nominal charge on presentation of a valid licence from your country of origin. Visiting from North America? Did we mention you need to drive on the left? Well, anyway. Left, left, left. Also brush up on your roundabout knowledge – give way to oncoming traffic on your right at all times and you’ll all be happy driving bunnies. Cars rule the roost on Grand Cayman, with buses up and down the popular Seven Mile Strip entertainment and bar district particularly numerous. Walking in the height of the day under the blazing sun is not recommended. It is possible to sail round the islands to your destination. Leisure trips to Stingray City and Rum Point by sail or motor boat are privately run. Anyone can navigate on the water, with the exception of shipping lanes. Within the reef, these are some of the flattest waters you will see in the Caribbean and beyond – ideal for casual trips. Weekends are most popular for locals to get out on the azure ocean.